Amsterdam-based Canadian Ryan Millar writes plays, feature articles, short film scripts, short fiction, comedy sketches, rap songs and – most recently – a book on improv. There’s also the blog on the right, which is filled with daily thoughts and weekly ideas. He divides his writing time between passion projects and freelance work. Ryan has nearly twenty years experience as a facilitator, trainer and coach. Drawing heavily on his improv background (with elements of storytelling and charisma best practices), he helps individuals and businesses improve the ways they think, interact and perform. Ryan has been teaching, performing, directing improv for nearly twenty years. In addition to teaching classes and doing shows in Amsterdam, he travels to festivals around Europe to perform and teach. 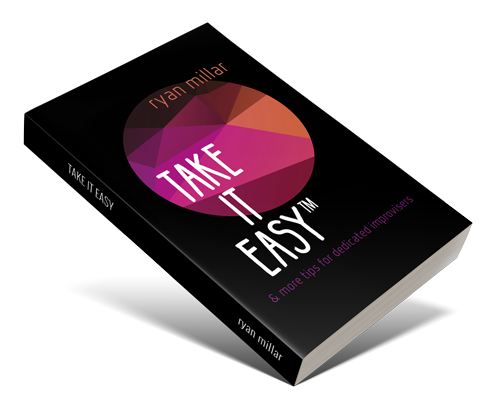 He first book, on the subject of improv, TAKE IT EASY, is now available. TAKE IT EASY™ isn’t about a new way of doing improv, nor is it meant to replace your own style or approach. Instead it’s a mindset that can inform your performance and approach to improvisation.